I’ve always thought that the Three Es theory of social marketing is a useful way of thinking about behaviour change. The three Es are education, enforcement, and engineering — and behaviour change is most likely to be successful when the three Es all work together. This week I saw an interesting version of engineering — presumably being used because education and enforcement weren’t having the desired effect. The engineering that’s happening here is that pedestrians are prevented from crossing the road until the light changes to green. Then the glass door opens and people can get through. When the light is red, pedestrians are forced to wait outside the locked glass door. 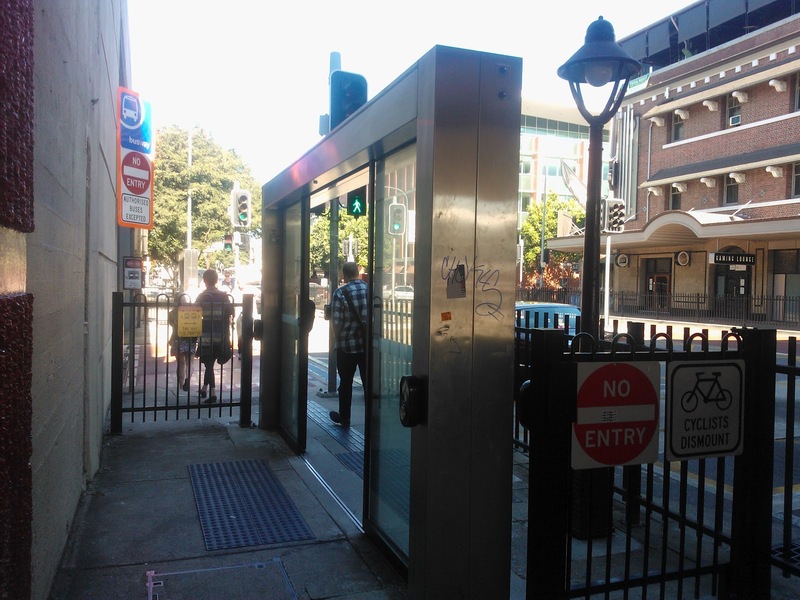 The crossing goes across a small lane that looks like a loading zone but is actually the entrance to a bus tunnel. My guess is that bus drivers had too many near misses (or non-misses). Education about the importance of crossing at green lights and the threat of enforcement through fines can’t have been enough, so an engineering solution was chosen. ← Home Page or Front Page?